Q: I have a small living room that I’m not sure what to do with. What are some design tips for making this room seem more spacious? Small living rooms can present a design challenge for most of us; however there are a few simple tips that can help you create a room that takes advantage of the space you have in the best way possible. First, think about the function of the room. For example, do you want it to work both for conversation and/or TV viewing? How much seating do you need? I always ask my clients what the optimum number of seats are for 90 percent of the time. There will always be times when you need extra seating, but plan for everyday use. Consider any storage requirements for items you would find handy to have in this room. Books, collectibles, computer related items … anything that you can plan to store out of sight to keep the clutter organized and at a minimum will help keep the spacious feeling. Also think about other special requirements. Perhaps you want to have a piano in this room; this will use a lot of space and needs to be planned for. Once you have identified function, seating and storage requirements, measure the room and note placements of doors, windows and traffic patterns, as well as electrical outlets and existing lighting. Now you are ready to decide what furniture placement will work the best for you. Creating a plan will give you a list of what you need for the space in the way of furniture so you don't make a purchase that doesn't work. When shopping for furnishings, always try to have the measurements and photos of your room with you; it is a great way to avoid costly mistakes. Think carefully about your walls and ceiling colors. Generally, you want to keep the walls and ceiling lighter rather than dark or bold. 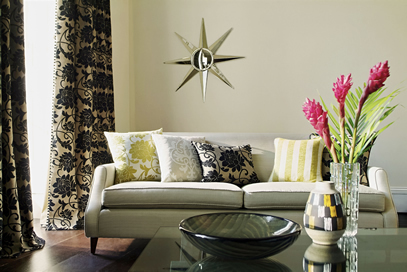 Stronger, darker colors do advance, and can make a space seem smaller. Using a lighter shade on the ceiling than the walls can create the illusion of higher ceilings and more space. Avoiding sharp contrasts in wall colors and flooring tends to expand the space as well. Scale is critical when furnishing a small room. Think about fewer pieces of moderate size and scale, rather than overstuffed larger furniture. Also, avoid the trap of lots of little pieces of furniture lining all the walls. This creates a feeling of clutter and will make your space seem smaller than it really is. With a bit of planning, even the smallest of living rooms can seem spacious! Colleen Hickey is an interior designer and owner of Furniture Classics. For information, visit furnitureclassicsak.com. Photo credit: Photo Arts by Janna.